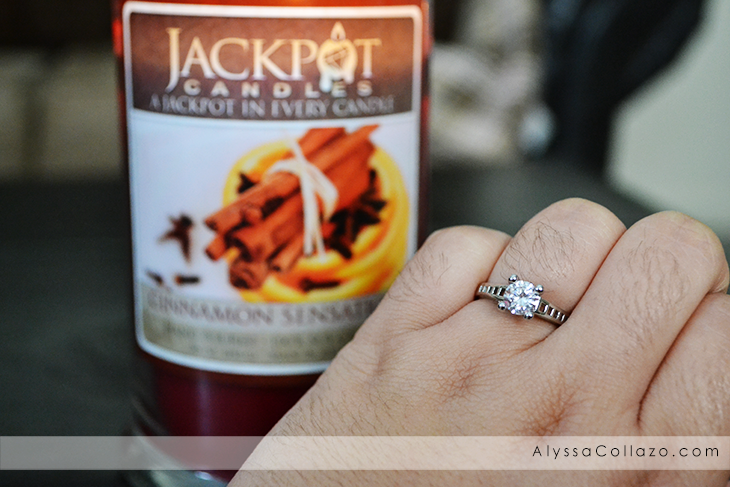 This is my second time reviewing Jackpot Candles, this time I went with one of my favorite scents, Cinnamon! My candle arrived very quickly and I immediately lit it. 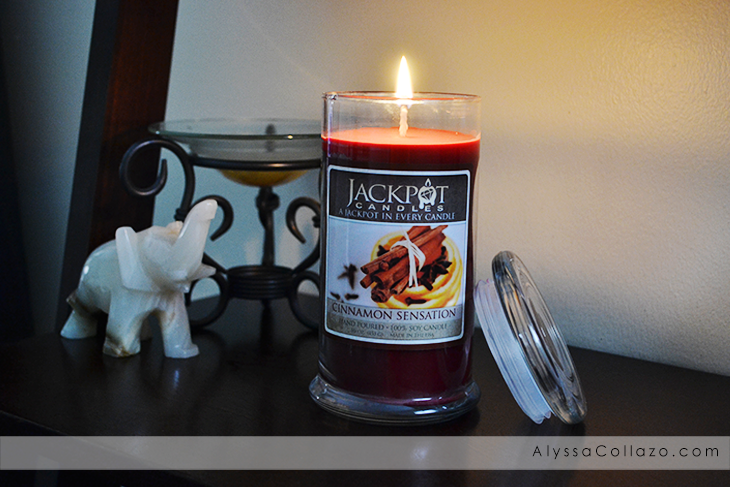 The Jackpot Candles Cinnamon Sensation scent is hands down the best Cinnamon I have ever smelled! The soy way is smooth burning and it has a nice strong smell, which I love. My entire house smelled warm, cozy and inviting! It's seriously the perfect anytime scent. It made me think of seasons changing to fall but since Summer isn't here yet, we will save that feeling for August. After visiting the Appraisal page and entering my code I learned my ring was worth $19.00. I love that I got to pick my ring size, so my ring fit perfectly! Jackpot Candles makes the perfect gift. Not only does it burn for 80 - 100 HOURS and is 100% Soy free & Made in the USA but you get surprise Jewelry item in every candle your purchase! You get to chose from a ring, earrings or a necklace! How cool is that? I highly recommend everyone giving Jackpot Candles a try, even if it's just once! You won't regret it. With Mother's Day right around the corner, Jackpot Candles is giving one of my lucky followers a Candle and Jewelry of your choice! One (1) winner will receive: A Jackpot Candles of your choice! Ends 4.30.15. Yum, cinnamon is one of my favorite scents, too! It looks like they have so many awesome ones on their site! I've heard of this company and, as a candle junkie, you'd think I would have purchased one by now, but just haven't gotten around to it. Thanks for reminding me that there are still brands I need to check out! I love jackpot candles. They smell wonderful, and there's always a cute, girly prize at the bottom. It's so much fun! I love lilac and sweet pea for summer! I would love to try the Lilac candle. I just love the scent of Lilac! The Banana Nut Bread should be a nice scent to try. What a great giveaway! I love the smell of cinnamon as well! I'll bet it smells delicious! I would enjoy the sweet pea. We enjoy lighting candles and changing the mood.. this is a great giveaway! My friends mom buys these candles all of the time! I love how amazing they smell and love the idea of getting a little surprise at the bottom! Great review! I would love to win this giveaway! My wife loves scented candles to begin with and the fact that there is jewelry inside just sweetens the deal. My favorite winter candle fragrance is cinnamon. In the summer I like citrus scents like lemon verbena and tangerine. Oh yeah, coconut, too - it reminds me of the beach. I love cinnamon candles! They make me feel so snuggly! I've never heard of Jackpot before, being in the UK, but they sound brilliant! I haven't tried these before. It's awesome that you get an awesome new scent and a surprise piece of jewelry with each candle. I love scented candles but have never come across the Jackpot brand before. Can't wait to try the cinnamon one--it is my favorite scent for fall! Oh I love Jackpot Candles. I love getting a little surprise every time that the candle has burnt out. Thanks for the great giveaway! I want to try the Sweet Pea Jewelry candle! I always have loved that scent! I would choose the Lilac candle. I love the smell of Lilacs and I am so exited that they will be blooming soon. I love these kind of candles. Like a kill 2 birds with 1 stone kinda thing.... a prize at the end: a piece of jewlery! What girl wouldn't love jewelry and a candle? What a great product and giveaway! These candles look really cool. Thanks for the great giveaway! I love burning candles and jackpot candles is one of my favorite brand. The ring is beautiful, you really hit a jackpot! These scents sound so good. I have heard of these types of candles before but still have not tried one. What a great giveaway to open people up to this type of prodcut. This is such an awesome candle! I heard about it before but haven't tried it. Waiting for it to come to South Africa. I would love to try the new Ocean Breeze scent. I used to buy candles like this all the time, but couldn't pick my size so they would never fit me. I am definitely going to be getting any future ones from Jackpot Candles. I would LOVE the Georgia Peach scent... that would be awesome. This is such a neat idea and it's so fun to have a surprise with every candle. Is your giveaway WW or only for the US? I have been wanting to try one of these candles. Do they deliver to Canada? I like that you can pick the ring size. I love these types of candles. I love that there is a little surprise at the end. Your ring is so pretty! I've never purchased a jackpot candle but I think they would make great gifts for friends. SO exciting! You did get lucky with your jewelry find! I like the idea of finding a surprise in the wax. I have heard great things about these candles. I love that they smell great and that you can pick what goes in your can;de as well as what size. Great review! I am obsessed with candles and very mad at myself right now that I did NOT know about this brand.. omg that is awesome! My favorite scent is apple spice cinnamon! I will defiantly be buying this once im in my new place! I'm interested in the Caramel Coffee Latte. I LOVE the smell of coffee! I really want to try blueberry muffin. I can't choose between Lilac and the Ocean Breeze candle scents. i would love to try the Caramel Coffee Latte or cinnamon bun candles. If I can only pick one I'll have to go with Vanilla Cupcake just because I know that is one the whole family would like, My 4 year old little girl and my husband just love vanilla cupcakes and it would give our home that nice welcoming scent of fresh baked cupcakes. If you want to make a regular profit from poker, then this online wesbite https://www.jetwin.com/en-us/live-casino is for you. play here with bitcoin,you will have more fun.